Fox 2000 has acquired the film rights to John Grisham's 2011 legal thriller The Litigators. (More details about the book, below.) A search is underway for a screenwriter. The studio is already producing an adaptation of Grisham's most recent novel, The Racketeer, with Daniel Espinosa directing. A third film based on the author's work is also in early stages of production: The Associate, with Adrian Lyne directing a screenplay by William Monahan. 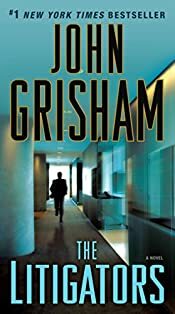 Eight of Grisham's earlier novels have previously been adapted for film, including The Firm, The Pelican Brief, The Chamber, and The Runaway Jury. The partners at Finley & Figg often refer to themselves as a "boutique law firm". Boutique, as in chic, selective, and prosperous. Oscar Finley and Wally Figg are none of these things. They are a two-bit operation of ambulance chasers who bicker like an old married couple. Until change comes their way — or, more accurately, stumbles in. After leaving a fast-track career and going on a serious bender, David Zinc is sober, unemployed, and desperate enough to take a job at Finley & Figg. Now the firm is ready to tackle a case that could make the partners rich — without requiring them to actually practice much law. A class action suit has been brought against Varrick Labs, a pharmaceutical giant with annual sales of $25 billion, alleging that Krayoxx, its most popular drug, causes heart attacks. Wally smells money. All Finley & Figg has to do is find a handful of Krayoxx users to join the suit. It almost seems too good to be true … and it is.